No more Miley and Mandy videos? 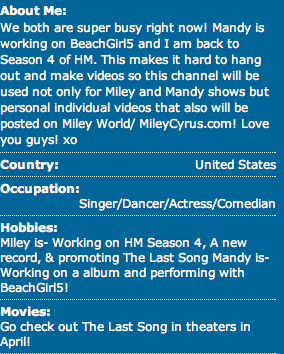 Miley and Mandy updated their youtube page ‘about me’. Looks like there won’t be any more M&M videos for a while. Tbh, I can do without Mandy but do want Miley videos. thanks hannah_mary87! Check out the print screen picture under this post! click for more. Miley & Mandy Bracelet Line!